Yes, we still plan to meet for breakfast in Cherry Valley at 9am. It looks like we survived the rain. There is a slight uptick in flow. A little stain to the water could be good as it was running very clear earlier in the week. So clear that stealth and long casts were the key. Water temps will be mid to upper 40's. It doesn't look like we'll have a big turnout but it only takes 2 to work out a shuttle. We would love to have you if it works out Joe. We can help with a shuttle so you don't have to ride your bike. We survived that awful weather event yesterday. One more shot of rain tonight so we'll see how it goes. For those interested in floating the Kish this Saturday, the river is in great shape right now. It is at a good float level and running very clear fro springtime. I've been poking around here and there and have caught several smallmouth 17-18" range. The fish are spreading out which makes float fishing a productive way to go after them. There is some rain coming in the next two days so we will need to keep and eye on the river conditions. I'll be there as the leader of this floatilla along with my father. River conditions are looking good for floating as the water is surprising clear for this time of year. Several 16-18" fish have been caught recently and things should get better as it warms up. I'm interested. Are we planning to met at the Cheery Valley Café? I was pilling on. As a long time Bears fan, its part of my grieving process. The 2018 Bears was a very likeable team with likeable personalities staring with Coach Nagy. They were in every game and played a very entertaining brand of football. It's a shame the way it ended. I heard Cody Parkey was in big hurry to get out of town after missing that game winning FG. I guess he just couldn't help himself. I heard he also send out 100 facebook apologies to Bears fans for missing the game winner. He only meant to send it once but he kept hitting post. Anyone seen that Bird Box movie on Netflix? That's no way to go through life. Back in the day I would make the drive down to Pekin, IL and fish Powerton Lake between Christmas and New Years. 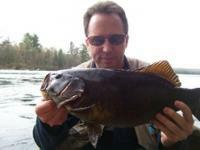 It used to be great smallmouth fishing by the warm water discharge but something changed. Does anyone catch smallies out of Powerton anymore? I caught a handfull of smallmouth bass yesterday, if that gives anyone hope. I love the winter fishing passion. It's tough in winter conditions but the peace and tranquility can be worth the effort. There could be a window this weekend to fish in milder conditions. You don't have to worry about other people in your spots. All this talk about the B&G but do they have one of these? Count me in either way.